This information is largely based upon Pengel and Hurt publications and correspondence between Christian Rogge and myself. By the end of the Seven Years War (1756-63) the look of Austrian Infantry had largely been set and standardised to what we are familiar with – the white coat, with white turn-backs and coloured lapels and cuffs. But reaching this simple and elegant uniform had not been a straight forward process and Austria’s infantry in the earlier War of the Austrian Succession (1740-48) had presented a far more varied and colourful appearance. 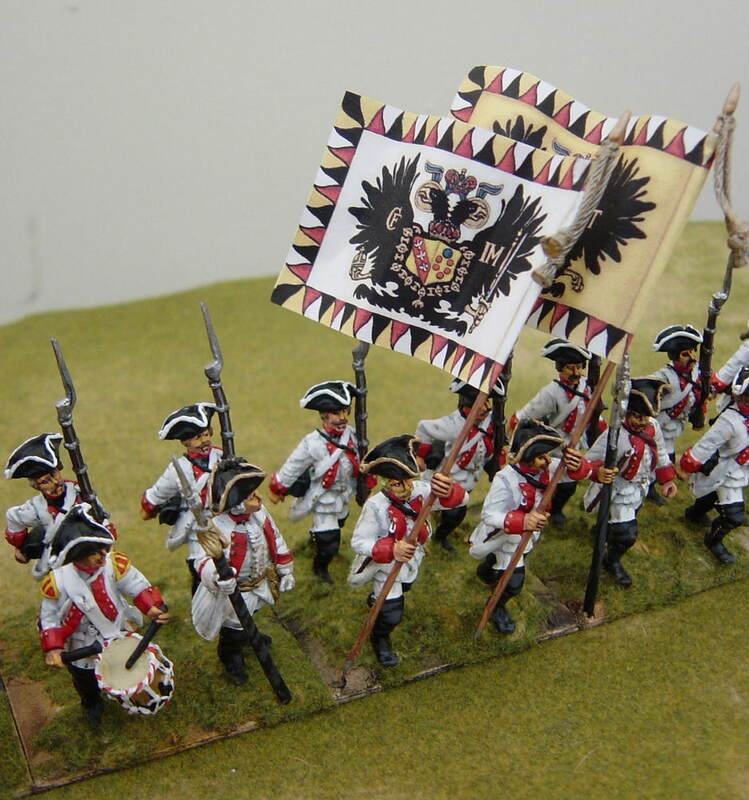 Most wargamers interested in the Lace wars tend to portray armies of the late SYW but I’d like to suggest that, in the case of Austria at least, choosing to replicate her army as a WAS army or an early SYW army will offer you a greater reward in both colourfulness of the uniforms as well as variety of flags. I’ll leave the issue of flags for another day and focus on infantry uniforms. *Although trousers could be in the vest colour, the greater likelihood is that they were soon replaced by white. The Pengel and Hurt information seems to stem from Friedrich Schirmer's “Die Heere der kriegführenden Staaten 1756-1763”. Schirmer lists vest colour and trouser colour and he seems to have taken the information from an existing “1757 Militär-Schematismus” (N.B. : an official contemporary Austrian source similar to the French État Militaire volumes). It lists a total of 18 German regiments that had turn-backs in facing colour, and 13 with coloured vests (and breeches). This is the information provided by Dr. Bleckwenn but he does not mention which ones. This is a short background on the sources. Morier's 1748 pictures (in the Royal collection) are accurate and basically the sole image source of WAS period. Not much changed till 1756. 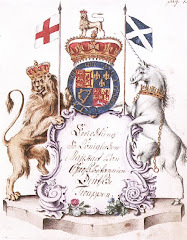 The change to white for vest and breeches took place after the WAS and before the SYW. But, as he states, a survey of regimental records implies that the commanders responded very slowly to any instructions from the Vienna Hofkriegsrat (Court War Council). The rule seems to have been that they ignored Vienna and responding was more the exception. It was the SYW, with it's much more centralistic and organized re-supply that changed things more, within a matter of 2 or 3 years, then the eight years between WAS and the SYW. As to the facing colours of the infantry in general. Bleckwenn identifies at least 3 shades of blue and possibly more. That presents all sorts of problems as accounts are rare and contemporary colour illustrations, even rarer. He does state a pale or light blue for Baden-Durlach (27) and this is confirmed by an observation from the battle of Prague. Schwerin was killed in front of this regiment, and it was identified by their light blue facings. He is sure there was only one shade of red. All variants are because of fading or poor copying by artists. 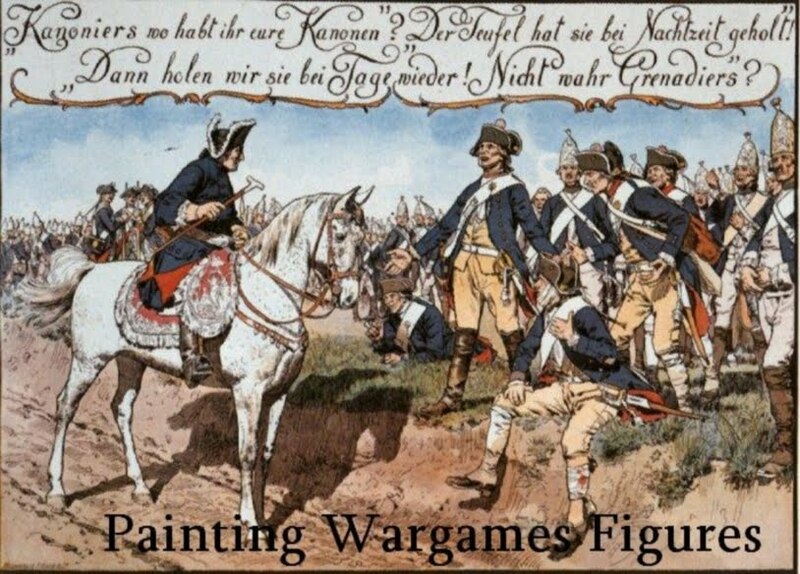 From another eyewitness we know that the Regiment de Ligne (38) was seen with rose coloured gaiter belts in 1762 as it paraded out of Schweidnitz. The same witness also saw a dead officer of the same regiment, sometime before, who wore rose Hungarian trousers, half boots and a rose "Soubise" (I take that to be a richly laced vest). Now that's completely against regulation! Bleckwenn states the infantry wore both red and black stocks and as they were issued with both, this sounds quite reasonable. and lapels only, from 1 November effective. This order never came into effect. In December 1757 it was recalled. The Hofkriegsrat gave in and said everything could remain as it was, but it did continue to insist on white vests and breeches. We may assume that from 1758 on, after the infantry's near destruction in Silesia, many regiments needed complete new outfits as they were rebuild. 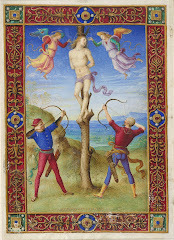 Then there is a different source kept at the Bauzten Museum (Lusatia/Saxony) called the "Bautzen manuscript"and it is dated from the same period. It provides some conflicting information. For example, Bautzen shows a Grün-Loudon Grenadier with an odd grenadier fur hat that Albertina does not show. Additionally, there is more information on pompoms and tassels. The latter, apparently, served the same purpose as the sword knots in other German armies. In other words there is the suggestion that they were coloured differently for each company. Lorraine IR 3*, Los Rios 9*, Salm 14*, Königsegg 16**, Alt-Colloredo 20, Sprecher/Lacy 22**, Starhemberg 24**, Wied 28*, Saxe-Gotha 30*, Ligne 38*, Jung-Colloredo 40*, Bayreuth 41*, Platz 43*, Clerici 44***, Luzane 48**, d’Arberg 55*, Mercy 56, Andlau 57**. Possibly also Pallavicini 15** - largely corresponding with Greenwood&Ball’s list. In addition, Bleckwenn knows of a record in the Erbprinz of Hesse-Darmstadt “Schreibkalender” that IR 8 Hildburghausen (red facings) had tambours dressed in dark blue coats in 1746 – apparently seen in Flanders – and violating the custom of reversed colour pattern. DOES REGIMENTAL LOCATION PLAY A ROLE? If one looks at where Regiments were garrisoned on the eve of the SYW, it can be speculated that all regiments stationed outside the Austrian heartlands of Austria, Bohemia, and Moravia, including a few more in Hungary and Siebenbürgen, were less likely to have paid attention to instructions from Vienna concerning uniforms. It seems, all regiments stationed in Italy, Netherlands, and the more remote south-eastern parts of Hungary/Slavonia, and Banat seem not to have caught up with latest regulations. Regiments located in the Austrian heartlands had also been involved in several pre-war revues held in Kolin and Olmütz and they would therefore have fallen under greater scrutiny and were thus much more likely to follow Vienna’s instructions pertaining to uniforms. In summary, if you were to field an army of the WAS or early SYW you could have a very colourful army – most notably perhaps IR 22 with red lapels and cuffs, blue vest, turn-backs as well as trousers. Plus drummers in some reversed facing combination! 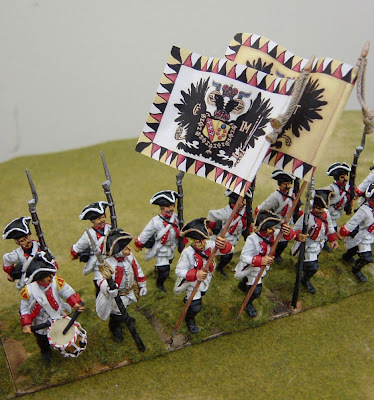 When you add to this, the strange and unusual flags possibilities (more on that another day) you can see, I hope, that the Austrian infantry presents a more colourful variety than at first glance. Actually there are a lot of good reasons to paint and play the WAS instead of or as well as the SYW. Thank you for an interesting and informative article, sir. Very interesting and useful. By the way the "Soubise" is a kind of pocket lacing. Search for pocket "a la Soubise" on the web to find images. Very nicely painted miniatures, Nigel. I have long had an interest in the WAS Austrians, and I look eagerly forward to any information you may have on earlier pattern flags. I've been able to find only the most fleeting references.